Home » Europe » The Alps are even Better when they are Green! The Alps are even Better when they are Green! 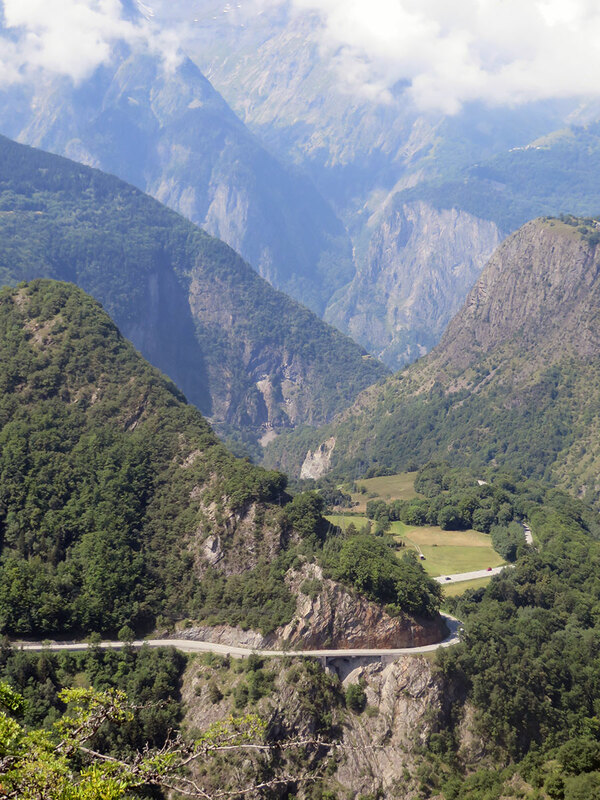 We left Aubusson and headed up to the Alps. The drive up there was varied and so pretty. Filled with fields, valleys and plains and finally spectacular mountains! I have been to the French Alps before but only when they were covered in Snow. I thought they were beautiful the first time all dressed in white, but hands down they are so much better when they are green! Every corner offered a new view and a new perspective and as much as I had been trying to cut down on taking too many photos (to help with culling and editing) I am afraid that plan went right out the window! 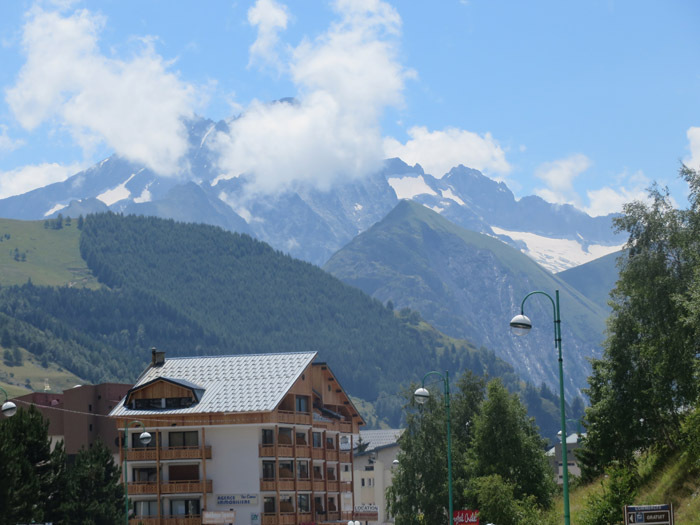 We had booked a villa/chalet which was in a little town near Alpe d’Huez and Les Deux Alpes. Little did we know that our GPS was set to taking us on the most direct route (i.e. shortest distance) and and a result our drive up there, whilst shorter than the normal (AKA safer road) was possibly the hairiest drive I have ever taken! We basically drove about 5km along the ledge of a cliff on a 3m wide path that had been carved out 50 years ago. You can see in the photos below the little railing to the side of our car (about 80cm high) and then the drop off to the side. It was terrifying and amazing all at the same time. Both Scott and I were worried another car would come along as there was no way we could fit two vehicles side by side! Needless to say we managed to survive the drive and shortly arrived at our lovely chalet. I hope we don’t meet another car! Our beautiful Chalet was in a tiny little village (La Balme) and was just gorgeous. We only needed two of the 8 large bedrooms and we had the place to ourselves for the first few days, it was bliss. There was a massive kitchen table (that could seat 22) a huge lounge area with 3 couches, huge fireplace, massive flatscreen and a wide DVD collection as well as lots of games and toys for kids. The lovely owners lent the kids some snow clothes and jackets and gloves for us for when we went up to the top of the mountains. The kitchen was really well equipped and spacious. We loved staying there as we could head out for lunch during the day and then cook our own food in the evenings when the boys were tired. We taught Tom how to play cards (Uno), and Milo managed to keep up as well (we only gave him the coloured, numbered cards to keep it easy) and did puzzles with the kids. It was so fun playing games with the kids. I can’t wait to get a few more when we head back to Bali as they really enjoyed it as well. There were also quite a few kids movies that were great for when we wanted to let the kids have some downtime and for us to get some work done. There was a great little walk just near the Chalet with a spectacular view. While we were up in the Alps we went to visit the snow for a day and to walk through an ice cave and also visited lots of little towns around the area. The food was wonderful (as per usual in France) and everywhere we looked our breath was taken away. There was a small supermarket up there but we decided to head back down the mountain (about 20 mins drive from our chalet) to the much large Casino Supermarket which was much larger and offered a wider range of products. It was also a little cheaper which was a bit of a bonus! Les 2 Alpes, minus snow! Les Deux Alpes was the closest Ski resort and was about 20 minutes drive up the hill. It was a lovely town with loads of shops, restaurants and ski/snowboard rental outlets. They had a creche for kids to go which we were thrilled about, however they didn’t accept children who hadn’t been immunised in France and as we weren’t keen on immunising them all over again, we gave it a miss! There is an iceskating rink and lots of activities for bigger kids (not a lot for toddlers) but we still managed to have fun in the town and we really enjoyed walking around in the sun. One of the things I loved most about the area was the absolutely amazing picnic spots. They all had incredible views and we just off the main roads so they were easy find. We took the boys a few times and had lunch on the edge of a cliff looking out over the mountains. The best place for a picnic! We stayed in the French Alps for a week and had a great time. I love the slower travel (although a week is still short) as it gave us a few days where we could stay at home all morning and just wake up slowly or get some work done. The boys loved having a big space to play and spread out in, and Tom was so excited to see and touch snow for the first time. I can’t wait to take them back and go skiing one day! Fantastic photos!! I don’t know if I necessarily agree though lol I went to Switzerland/France when the Alps were white and I think the snow is magical! Though I’ll take the warmer climate I’m assuming you had!! I thought the Alps were beautiful when they were white and then I saw them in green and I was converted! Up until then I never really understood why people went outside ski season! That looks fabulous – except the road, that would terrify me too. It would never occur to me to go to the Alps in the warmer months, but now its yet another thing to add to my never ending bucket list. OMG it was so scary. There was a point where I was almost paralysed with fear of falling off! Yes definitely add this to your bucket list, it was amazing! Glad you found it such a relaxing place. I loved the cheeses and found the little town of Aubusson very quaint.